Which inspired me to put together a blog at my OTHER site, IT Toolbox. Have a look here and see if you agree that hacking yourself once in a while is a prudent thing to do. 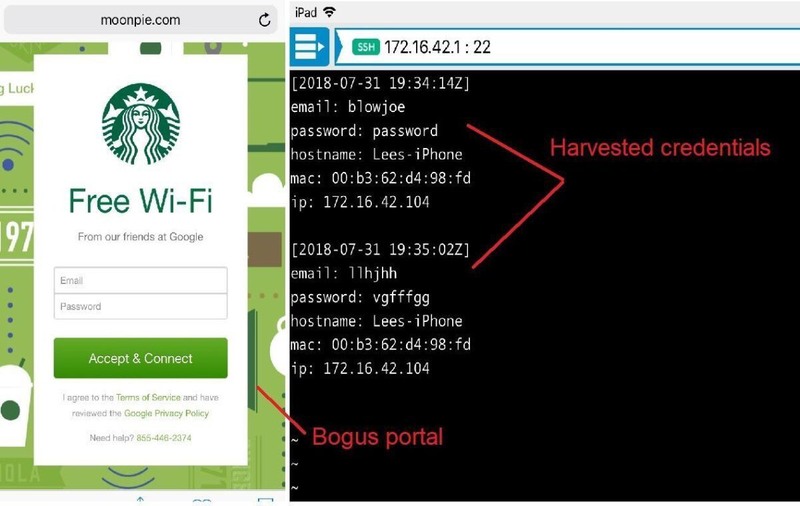 This entry was posted in Security, Wireless Networking, WLAN and tagged Hak5, Wi-Fi Pineapple, WLPC on August 2, 2018 by wirednot. This post was created for a ten-minute talk for the Wireless LAN Professionals Conference (2018). Want help getting started in blogging? Hopefully this blog lights a little fire for you, and I’m always happy to answer questions if you reach out. Want to blog about Wi-Fi? 1. Take the first step. Writing, like public speaking, puts you “out there” for praise and criticism. If you’re gonna do it, do it. 2. Be yourself. Your words, your thoughts, your style. It’s OK to be inspired by others, but the world needs YOU, not you copying someone else. Write from YOUR experiences and discoveries. 3. Have something to say, but don’t force it. When the time is right to get your shareable thoughts out, you’ll feel it. 4. Put a fresh angle on the topic, whatever it is. Find something else to lead with that others aren’t discussing, some under-told feature or use case, etc. It’s OK to write about what others are writing about, but find some way to make it fresh, even if just subtly so. 5. Write often enough to stay relevant. If you last wrote back in 2015, chances are you’ve fallen off of most people’s radar. Every few weeks is OK, every few months is acceptable. Beyond that, don’t expect a lot of readers. Bonus- the more you write, the better you will get at writing. 6. Blogs aren’t novels- people have limited reading time. Don’t write more than you need to on a topic. 7. Promote, and be promoted. Get proofreading help early on if you need it; your blogging “advisor” will likely promote your blog. 8. Don’t be thin-skinned, and keep your ego in check. BTW- none of us know everything. And “experts” aren’t omnipotent- know the difference when interacting with people. 9. Any comments/feedback are worth responding to (almost). Stay respectful, and try to foster healthy dialogue. But it’s better to delete hyper-caustic comments than to reply with rancor. 10. Money can be made writing for the right outlet (or company) but generally it takes a while to build up to that- and you might have to know someone to get in the game. Unless you’re truly gifted, you won’t get rich with blogging. But you might develop a nice side income, and get other writing gigs. This entry was posted in Wireless Networking and tagged Blogging, Lee Badman, Social media, Wi-Fi, WiFI, wirednot, Wireless LAN Professionals, WLPC on February 21, 2018 by wirednot. When Ekahau’s Sidekick Wi-Fi measurement hardware product came out, I was fortunate to be a pre-release beta tester and to be along for the ride when Sidekick went public. I wrote about it here at wirednot and on my IT Toolbox blog as well. There was a lot of buzz and energy around Sidekick’s debut, but that sort of excitement doesn’t always last very long. Being the inquizitive type, I got wondering about how Ekahau themselves thought the launch of Sidekick went. To satisfy my curiosity, I called my my favorite Finnish guy Jussi Kiviniemi- Ekahau’s Senior Vice President (and someone I consider a pal). Our conversation is summarized here. Lee: So Jussi- It’s been a few months since product release. Did Sidekick meet Ekahau’s expectations as far as customer response goes? Jussi: I have to tell you, Lee, that response has been wonderful. It’s been beyond our expectations, which is why we’ve had a bit of a backlog of units to ship. Now that our factory line has reached pretty much full speed, the unit wait time has decreased to a couple of weeks. Our customers themselves have helped to spread the word, and we’ve also been busy working different events like Cisco Live and Aruba Atmosphere to raise awareness. Lee: Awareness has definitely been raised, I’d say. Does the favorable response at this level surprise you at all? Jussi: Thankfully a lot of bloggers and Ekahau believers have been great advocates for us and Sidekick. We are really lucky like, that, and appreciate it very highly. If anything surprises me, it would be that despite the cost and that there isn’t another product like this out there to compare to, there has been this overwhelming response. Lee: Have you found that Sidekick’s warm reception has bought any tangential benefits to Ekahau in general? Jussi: We’re selling A LOT more of our Ekahau Site Survey / Planner software as well, which is wonderful. Some of that is certainly due to Sidekick, but truth be told, our strengthened sales team has also successfully got the new distributor framework going on at the same time, which is further getting both Sidekick and ESS more exposure in the US and globally. Lee: So what distributors are on board now? Jussi: Within the last year, we’ve added more than a dozen new distributors all across the world. Ingram Micro is a big new one, Synnex is another big, they’ve been with us for a while already. I also have to mention that we’ve got our long-running Technology Partners as part of our family, too. And it’s not just the CIscos, Arubas, Ruckuses and Huaweis of the world we work very closely with. Think about Keith Parsons of Wireless LAN Professionals as an example- the Ekahau training that he and his all-star team provides is so good… because his services are excellent, our tools look that much better, and that helps spread the word. Lee: Awesome- and agreed on WLAN Pros. So I have to ask: what comes next for Sidekick? I learned as an early user that this tool is expected to evolve. Anything you can share yet in that direction? Jussi: Oh you’re right, Lee, that we’re far from “done” with Sidekick’s capabilities. It’s the foundation of our future business – the future software products of coming years will be built around the Sidekick that was released in September. I can’t really say too much specifically, but I will share that in early 2018 we’ll be announcing additional capabilities for the currently shipping Sidekick that will make the survey process significantly easier and more convenient. Let’s just leave that one there for now. Lee: Aw, you big tease! At least you’re giving us all something to dream about… Now what about ESS- what else is coming there? Jussi: Again, I can’t spill too many beans right now. But we know we have competition, and we respect where maybe they have a discreet feature that we lack in ESS. We’re working on those…Also our customers ask us if we’ll be doing any cloud-based project management and sharing kind of stuff. Ekahau is well aware that the world is moving to the cloud. We’re living in the world, too, so all I can say is keep watching for announcements. Lee: Alright, Jussi. Fair enough. Congrats again on Sidekick’s success to date. When am I going to cross paths with you again- maybe WLPC? Jussi: Thank you, and absolutely, I’ll be there to talk through some of our upcoming stuff with our team. BTW, the registration for WLPC is now open, and it always sells out. Just saying… Always great talking to you Lee! This entry was posted in Conference, Ekahau, Wi-Fi, Wireless Networking, WLAN tools and tagged Ekahau Site Survey, ESS, Interview, Jussi, Keith Parsons, Sidekick, WLPC on December 17, 2017 by wirednot. There are conferences, then there conferences. As a wireless network professional, my own absolute favorite, not-to-be-missed event for total immersion in quality WLAN-oriented sessions is WLPC (Wireless LAN Professionals Conference). The conference link is here– check back occasionally for updates. But I’m not just shilling for my pals that run the event (OK, maybe I am). Those of you reading this have the opportunity to shape the event. The event managers have solicited and received pitches for a really impressive range of topics to be presented at WLPC 2018, and now it’s time to take those submissions and build an event. There can be no bad outcome here. However the agenda shakes out, it’s going to be excellent, educational, and enjoyable. Now, we need YOU to take a couple minutes and share what you would like the agenda to be. I just did mine- took me about 10 minutes… the survey link is here. Make your voice heard! Hope to see you at WLPC. This entry was posted in Wireless Networking and tagged Wireless LAN Pro Conference, WLPC on November 8, 2017 by wirednot. As we close out 2015, many of us that consider ourselves wireless professionals are planning our training and conference agendas for next year. (Soapbox moment: wireless changes fast. Methods, solutions, culture, industry trends. If you don’t HAVE a training agenda for next year, make one now. Even if you don’t have travel budget, there is a lot you can do from your own corner of the world- minimally make a list of things you want to learn or get sharper on, and then figure out some way, any way to meet those goals.) If you are conference or training shopping, I suggest that you consider the 2016 Wireless LAN Pro Conference. For the money, you get a lot, both in SWAG and in content. The people. From the organizers, to the presenters, to the fellow attendees, this is a wireless-minded crowd. Every waking minute can have value if you’re receptive to that. There are no vendor sessions, no sales pitches. It’s a good mix of perspectives in play- you’ll find industry veterans, individuals that work for VARs or run their own companies, end users, newbies, and every other niche. I don’t agree with everything I’ve ever heard at WLPC, as a WLAN vet “of a certain age” myself. At the same time, I need my own beliefs and philosophies challenged, and I continue to learn why others think as they do on the endless specific topics that make up our fascinating trade. From implementation approaches to policy thought to end-user experience and “how things ought to be”, this a thought arena where all opinions are valued and the Know It All Factor is minimal. That I like. So it’s a great conference, yes- but there is also another draw to WLPC. For those interested in the highly-respected CWNP certification training, there are also in depth training sessions conducted by industry experts. If you can make it, I hope to see you there. This entry was posted in Training, Wireless Networking, WLAN and tagged CWAP, CWDP, CWNA, CWNP, CWSP, WLAN Training, WLPC on December 20, 2015 by wirednot.